Visit along with TravelCrete.Tours Heraklion, the capital and largest city of Crete, abounds with buildings, narrow streets, monuments, and churches that bear witness to its centuries old history. Birthplace of El Greco and Nikos Kazantzakis. This bustling city has a charming waterfront and a historical center with its rich history. Discover the past and the present of a city that combines old with new. 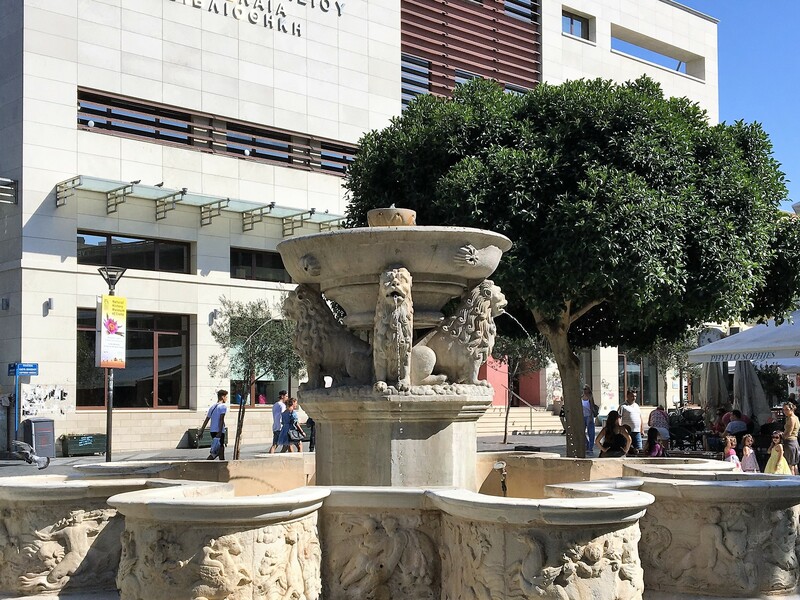 The Heraklion city Walking tour last 120 minutes and appeals to every visitor, regardless of age. What to expect: Easy walking tour (expect some steps, walk through pedestrian streets), seeing the city’s most important monuments, with your licensed guide, providing information about the city’s attractions. Feel free to ask your licensed guide any questions. A lovely Port that still today displays its strong character as one of the strongholds of the people’s republic of St.Marcus, the winged lion today stands silent embedded in the fort of the harbor. To the East the Venetian ship yards that once built war ships! St.Titus disciple of St.Paul and first bishop of Crete in the 1st. Century A.D. The impressive once Venetian Basilica of the Venetian Era was converted into a Mosque during the Ottoman Era and today it is an Greek Orthodox Church. Coats of Armor, Venetian Nobility, Laws, Taxes for the Lion of St.Marcus of the republic of Venice needed to be housed and served! An impressive building of administration and authority then and today! Once the Basilica of St.Marcus of the Venetian Period stripped of its bell tower and converted to a Mosque during the Ottoman Era! Today this building of devotion is a center of fine arts, concerts exhibitions. The little lions as the locals say for their beloved once wild beasts! A fountain of lions, embraced by nymphs dancing around them. The heart of the city of Heraklion. St.Menas the patron saint of Heraklion, today this impressive cathedral stands in a large square. But if ever Heraklion is in danger or suffers st.Menas will emerge like in the past and we shall all hear him galloping through the city our patron and protector. A market sun-kissed full of spices from far away lands as well as local. Fruit, vegetables, scents a chance to see, smell, meet with friends choose with love and affection your daily food. For in Greece we say love goes through the belly! Yes we can smell, cook taste and even eat affection and love. Freedom a concept and word synonymous for all Cretans! Freedom… liberty for they have fought for it so much. Honor your ancestors, remember those before you who fought for liberty. When: Year round, except national celebrations and Greek official holidays.